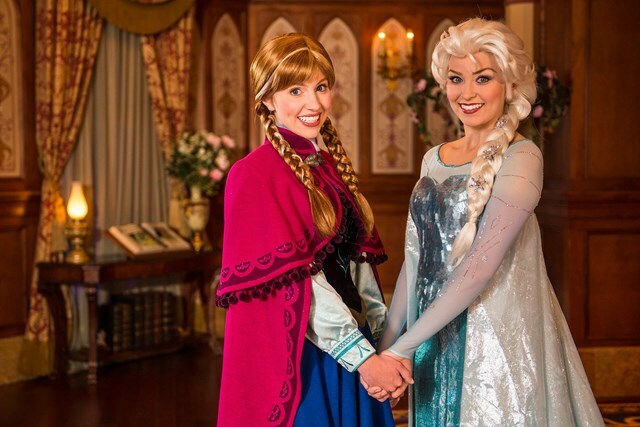 The immensely popular Magic Kingdom Frozen meet and greet with Anna and Elsa will be getting extended hours. Beginning June 1 2014, the Frozen meet and greet at Princess Fairytale Hall will operate from park opening to park close. FastPass+ availability will also be expanded with the new operating hours. Previously, the Frozen meet and greet closed in the early evening. With the new hours, Snow White will meet guests in the Town Square Courtyard. Here are the merchandise events headed your way this June at Walt Disney World Resort! 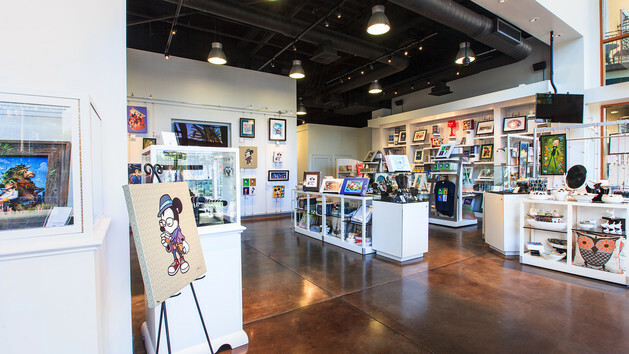 June 4 – 8: Artist Greg McCullough returns June 4 – 8 to Animation Gallery in Disney’s Hollywood Studios and will appear later in the month from June 18 – 22 at Art of Disney in Epcot. June 5 – 8: Look for special appearances by artist Larry Dotson throughout the day at Art of Disney in Downtown Disney Marketplace. Not able to make it? Look for Larry later in the month from June 12 – 15 and June 26 – 29 at Main Street Cinema in Magic Kingdom Park. June 12 – 22: Find the latest releases from Precious Moments doll designer and artist Linda Rick at Once Upon A Toy in Downtown Disney Marketplace. Add to your collection and meet representatives June 12 – 22 and June 26 – July 7. Look for a special appearance by Linda throughout the day, each day, June 12 – 15 and July 3 – 6. June 14: World-renowned Celebrity DJ Pauly D will appear in the Downtown Disney Marketplace from Noon to 1 p.m. to sign his recently released line of DJ Pauly D headphones from SMS Audio. Please continue to watch for more information on the exact location. June 14 – 15: If you are geared up for excitement at the thought of Car Masters Weekend, be sure to keep an eye out for a special post from fellow author, Steven Miller. June 20 – July 3: Artist David E. Doss will be appearing daily at Art of Disney in Downtown Disney Marketplace. Stop in and find a new piece of art to add to your collection! Learn more. 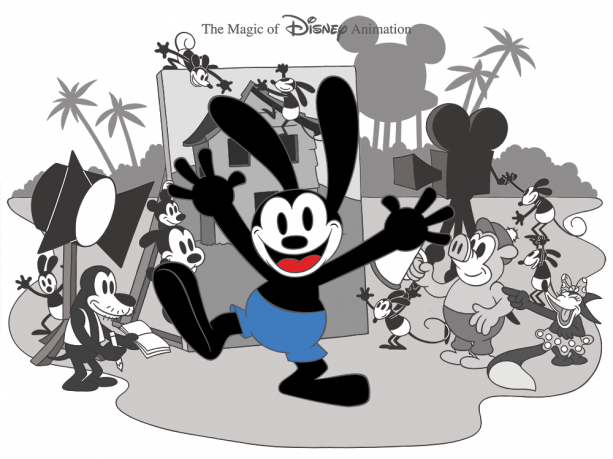 June 21: Stop by Animation Gallery inside Disney’s Hollywood Studios for the limited edition release of “Studio Flashback,” featuring Oswald, and meet the artists from 10 a.m. – 1 p.m. and 2 p.m. – 5 p.m. Can’t make it to the event? Order yours now! June 28: Now, all the world is Figment’s stage! To celebrate the launch of the new, limited edition figurine, Figment Actor, sculptor Jacqueline Perrault will be on hand for a special appearance and signing from 11 a.m. to 1 p.m. and again from 3 to 4 p.m. at Art of Disney in Epcot. Unable to make it? Take advantage of a special pre-purchase opportunity now through June 27. Also appearing for a special artist signing will be Kevin-John from 1 – 3 p.m. The character musical chairs continues at Disney’s Animal Kingdom this weekend with Donald Duck’s meet and greet moving again. 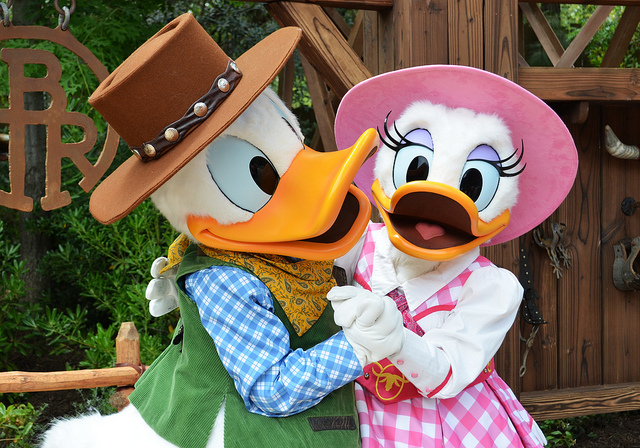 Beginning on June 1 2014, Donald will be leaving Daisy at the Character Landing on Discovery Island and will be heading back to the Cretaceous Trail in DinoLand U.S.A.
Festival of the Lion King at Disney’s Animal Kingdom is scheduled to reopen on June 1 2014 in its new home in Africa. The show which will be located in the new ‘Harambe Theater,’ will be the same as the original that was shown in Camp Minnie Mickey, and will offer FastPass+. Also part of the new ‘Harambe Theater’ area will be a new merchandise kiosk called ‘Mariya’s’ – offering Lion King merchandise. Showtimes are on the hour, with the first beginning at 10am. Festival of the Lion King appears to be nearing a reopening in its new home in the Harambe Theater, according to sources. Cast Member previews are scheduled to be taking place later this week. This is typically a good indicator that an opening to guests will occur in the near future. 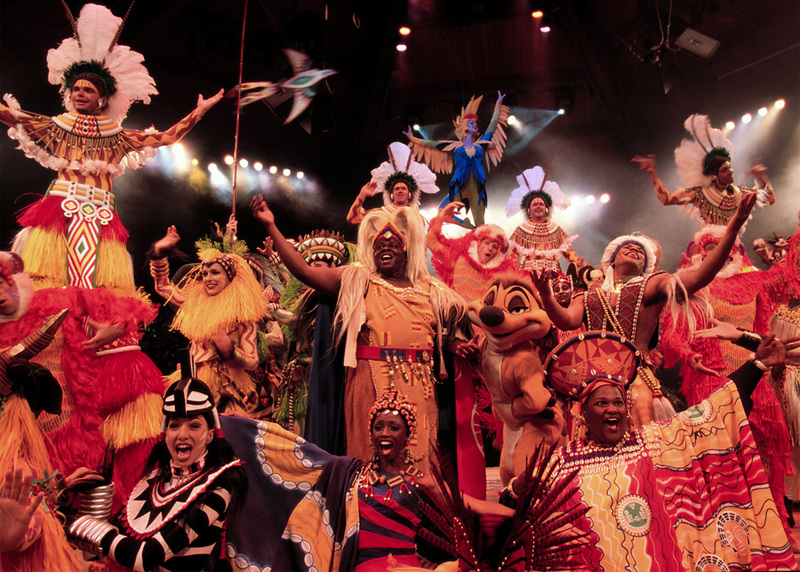 Festival of the Lion King closed in its original Camp Minnie-Mickey home back in early January 2014, and will be reopening in a brand new theater in the Africa section of Disney’s Animal Kingdom. Disney has not yet announce any reopening date other than “summer 2014”. 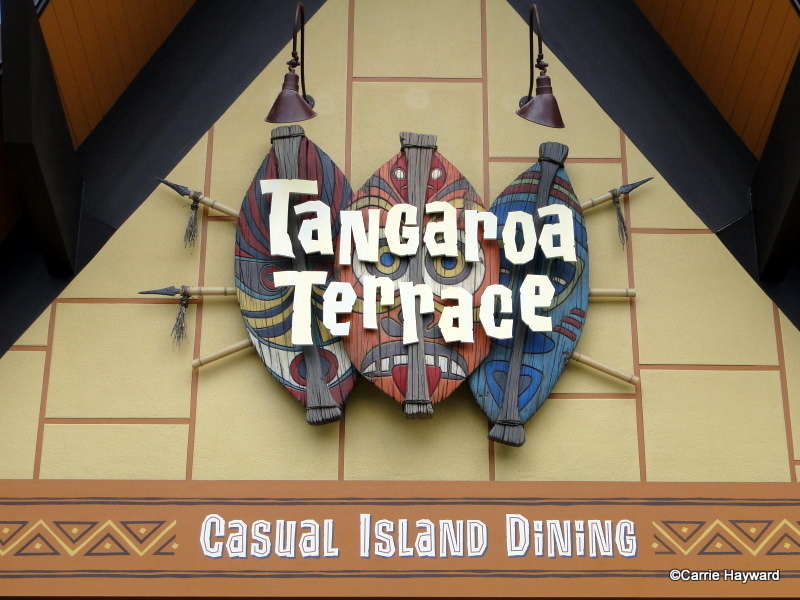 Tangaroa Terrace is a favorite stop for a quick bite at the Disneyland Hotel, especially when it’s a perfect Southern California day and we can snag a seat on the patio overlooking the Monorail Pool. Starting with breakfast, they’ve added the Loco Moco, a burger served over rice with brown gravy and a fried egg with a side of island fruit. Aloha! This reminds us of breakfast at Aulani, a Disney Resort & Spa. Get healthy with a bowl of apple cinnamon-spiced steel-cut oatmeal served with coconut whipped cream and island fruit. Or opt for Mickey-shaped waffles with fruit and bacon or Portuguese sausage. The all-day menu starts at 11 a.m. (through closing at 10 p.m.) and new on the menu are shrimp tacos with sautéed shrimp, cabbage and lime tartar sauce all wrapped up in warm corn tortillas and a side of tropical slaw. Also, a slow-roasted kalua-style pork sandwich is on a sweet Hawaiian roll topped with tropical slaw. Or teriyaki chicken breast that comes with fresh caramelized pineapple, Havarti cheese, bacon, lettuce and tomato on a multi-grain bun. Side options include tropical slaw, sweet potato fries, french fries or island fruit. Tangaroa Terrace Salad adds more tropical flair with lettuces, cabbage, black kale, caramelized pineapple, grape tomatoes and crispy marinated tofu, all tossed in a sweet vinaigrette and topped with toasted macadamia nuts. (Substitute sautéed shrimp for the tofu for a little extra.) And the Big Island Flatbread is topped with marinara sauce, ham, caramelized pineapple, red onion, cilantro and mozzarella. Trader Sam’s Enchanted Tiki Bar fans will love three new cocktails. Start with the Murky Mojito made with rum, fresh lime juice, mint and organic agave nectar topped with a splash of Angostura bitters. Or the Passionate Python with dark and aged rums, red passion fruit and tropical juices, garnished with an orange peel “python.” If you’re foregoing alcohol, try the Polynesian Punch, a mix of Sam’s Gorilla Grog with hibiscus grenadine. Sit back, sip and let the fun begin. Seven Dwarfs Mine Train, a playful and musical family-style coaster that immerses guests in the timeless story of Snow White and the Seven Dwarfs, officially opened at Magic Kingdom today in time to greet summer guests to Walt Disney World Resort. Joined by Big Brothers Big Sisters of Central Florida and Orlando Magic players Victor Oladipo and Tobias Harris, Magic Kingdom vice president Phil Holmes welcomed park guests as the first riders to experience the newest attraction at Walt Disney World Resort. Featuring an innovative, first-of-its-kind ride system, guests boarding the Seven Dwarfs Mine Train pivot back and forth during twists, turns, hills and drops. Guests are transported through magical mountain scenery and a glowing mine with scenes of the Dwarfs and frolicking forest creatures. Music from the film classic accompanies the journey. 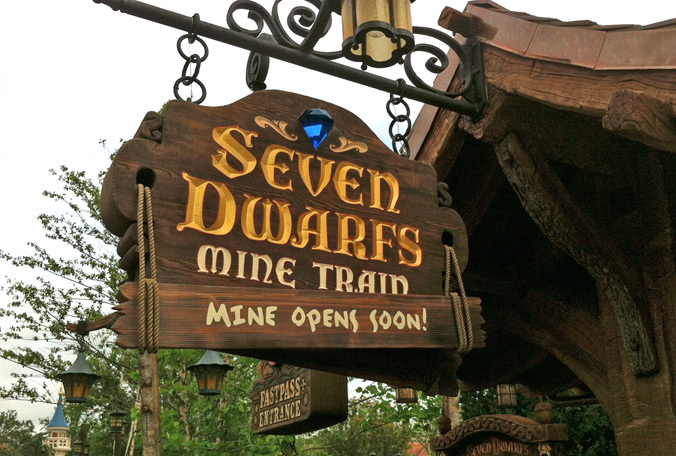 Seven Dwarfs Mine Train features spectacular Audio-Animatronics – with cars slowing down so guests can spot favorite characters making an appearance in different scenes. At ride’s end, the cottage of the Dwarfs, replicated from the film to exacting detail by Walt Disney Imagineers, comes into view with a dancing Snow White visible through a window. Guests can reserve access to Seven Dwarfs Mine Train with FastPass+ in advance of their visit to Walt Disney World Resort usingMyDisneyExperience.com a component of MyMagic+. Start your summer off right! Here’s a look at some of the merchandise events headed your way in June at the Disneyland Resort! June 7: Need a Father’s Day gift? Meet representatives from Goorin Bros. at D Street in the Downtown Disney District from 1 – 4 p.m. and find the perfect headwear for dad. June 7: Meet artist SHAG from 5 – 7 p.m. at WonderGround Gallery in the Downtown Disney District as we debut his newest piece Morning in the Magic Kingdom. June 7 – 8: Meet artist Katie Kelly each day from 10 a.m. – 4 p.m. at Off the Page in Disney California Adventure park. June 7 – 8: If you have been waiting for just the right time to order one of artist Dave Avanzino’s Custom Letter Plaques, you’re in luck! Dave will be appearing from 11 a.m. – 7 p.m., each day at Disneyana inside Disneyland park. June 7 – 8: Artist Erin Leong, will appear from 1 – 4 p.m., each day at WonderGround Gallery in the Downtown Disney District. Not able to make it? No problem! Erin will return later in the month, look for her again June 28 – 29. June 8: Meet author Charles Solomon who will be on hand for special appearances and signings of his newest book, “Once Upon A Dream: From Perrault’s Sleeping Beauty to Disney’s Maleficent,” from 9 – 11 a.m. at Disneyana in Disneyland park and 1:30 – 3:30 p.m. at Off the Page in Disney California Adventure park. Joining him will be renowned Executive Producer Don Hahn. June 21: Artists Pascal Campion, Jerrod Maruyama and Whitney Pollett will take part in an artist signing from 11 a.m. – 1 p.m at WonderGround Gallery in the Downtown Disney District, as we celebrate the release of some of their latest works. June 21 – 22: Meet artist Nidhi Chanani from 1-4 p.m. at WonderGround Gallery in the Downtown Disney District. June 27 – 29: Meet Precious Moments doll maker Linda Rick who will be appearing throughout the weekend from 12 – 10 p.m. at China Closet in Disneyland park. Artist in Residence: Appearing at WonderGround Gallery in the Downtown Disney District throughout the month of June is artist Noah. Look for artist showcases on the following dates: June 6, 13, 14, 20, 21, 27 and 28 from 6-10 p.m.
Last chance! It’s not too late to get your tickets to attend the Tim Burton’s The Nightmare Before Christmas in Disneyland Trading Event. Which event are you most excited to check out? May the Force be with you during the all-new Star Wars Half Marathon Weekend at the Disneyland® Resort. It’s a weekend journey to a galaxy far, far away featuring various runs, special events, Disney entertainment, your favoriteStar Wars and Disney characters to cheer you along the course, and much, much more! Choose your Destiny! There’s a run for Jedi Knights and Padawans of every age and skill level including the Star WarsHalf Marathon, Star Wars 10K and Star Wars 5K, and the runDisney Kid Races. Put yourself to the ultimate test and join the Star Wars Rebel Challenge combining the Star Wars 10K and Half Marathon for an out-of-this-world running adventure. As Jedi Master Yoda says, “Do or do not. There is no try!” So DO be a part of the inaugural 2015 Star WarsHalf Marathon Weekend, January 15-18, 2015. Registration for the Inaugural Star Wars Half Marathon Weekend opens at Noon EDT on June 10, 2014. Sign up here for an email reminder. The Power of the Force meets the Magic of Disney! Jump into hyperspace and feel the power of the Force during the first-ever Star Wars Half Marathon run at theDisneyland® Resort. It’s a 13.1 mile intergalactic adventure in the most magical place on Earth. Your course takes you through Disney California Adventure® Park, past Disneyland® Park, and then on to the terrestrial streets of surrounding areas. Follow the path to the Light Side with your Star Wars favorites cheering you on your galactic journey. Never underestimate the power of the Dark Side. Darth Vader and the Forces of the Dark Side are not far behind! To receive the Star Wars Rebel Challenge Finisher Medal, you must register for the Star Wars Rebel Challenge. Registering for the 10K and Half Marathon individually will not make you eligible to receive the Star Wars Rebel Challenge Finisher Medal. Dates, times, prices and inclusions subject to change. All races are subject to capacity limits and may close at any time before the percentage can be updated. Registration fees are non-refundable and non-transferable. *Participants must attend Packet Pick-up at the runDisney Health & Fitness Expo to receive their race packet, bib, and tech shirt. Finisher medals will be distributed to finishers during the race. None of these items will be mailed to registrants. The Ultimate Test for a Star Wars rebel! Welcome to the rebel alliance! Now you can use the Force to amplify your strength and endurance in the ultimate test of your running skills during the Star Wars Rebel Challenge combining the Star Wars 10K on Saturday with the Star WarsHalf Marathon on Sunday. You’ll need all the power of the Force for this 2-day, 19.3-mile run. Rebels who finish both races are awarded the Star Wars Rebel Challenge Finisher Medal in addition to the Half Marathon and 10K Finisher Medals. You must register for the Star Wars Rebel Challenge to receive the Star Wars Rebel Challenge medal upon completion of both races within the pacing requirements. * Participants must attend Packet Pick-up at the runDisney Health & Fitness Expo to receive their race packet, bib, and tech shirt. Finisher medals will be distributed to finishers during the race. None of these items will be mailed to registrants. Feel the power of the Force! The Star Wars 10K race begins on Disneyland Drive where you’ll pass under the Downtown Disney® District on your way into Disney California Adventure® Park. There you’ll make your way through all the glitz and glamour of Hollywood Blvd, race down Route 66, and past breathtaking Paradise Bay. The race will travel down turn-of-the-century Main Street U.S.A., before it makes its way around the Rivers of America. After Disneyland®Park, the race will cut through Downtown Disney® by the Disneyland® Hotel continuing on to the City of Anaheim. You’ll race through the enchanting, historic neighborhoods of downtown Anaheim, down the Anaheim Center Street Promenade and past Anaheim Ice on your way towards City Hall. Before returning to the Disneyland® Resort, you’ll make your way past the Anaheim GardenWalk and then it’s on to a spectacular finish near Disney’s Paradise Pier® Hotel. Make it a Jedi Adventure! Make it a Jedi event and bring out the whole gang Friday morning for the Star Wars 5K. May the force be with you as you make your way through the thrilling Disney California Adventure® Park, followed by a run along magical Main Street U.S.A. and past Star Tours in Disneyland® Park. It’s an intergalactic adventure for adults, teens, and tweens. * Participants must attend Packet Pick-up at runDisney Health & Fitness Expo to receive their race packet, bib, and t-shirt. Finisher medallions will be distributed to finishers during the race. None of these items will be mailed to registrants. Jedi training for the tiniest Padawans! It’s never too early to start your Jedi training! Every child eight and younger is invited to join the fun and participate in the runDisney Kids Races during the Star Wars Half Marathon Weekend. Encourage your child to be a part of the excitement and sign up for any of the Kids Dashes. There’s even a Diaper Dash for crawlers! Space is limited. Each participant goes home a winner with a Finisher Medallion to remember all the magic. Parents are allowed to run with their children, but only registered children will receive a finisher medallion. The event will follow a rolling start beginning with the 100m dash followed by the 200m, 400m and Diaper Dash. Dates, times and prices subject to change. Some Kids Races event categories may fill up before others. All races are subject to capacity limits and may close at any time before the percentage can be updated. Registration fees are non-refundable and non-transferable. *Participants must attend Packet Pick-up at runDisney Health & Fitness Expo to receive their race packet, bib, and t-shirt. Finisher medallions will be distributed to finishers at the conclusion of the race. None of these items will be mailed to registrants. Kick off your Star Wars Half Marathon Weekend with your fellow Jedi’s at the Star WarsWookiee Welcome Party! Dates, times and prices subject to change. Welcome Party subject to capacity limits and may close at any time before the percentage can be updated. Tickets are non-refundable, non-deferrable, and non-transferable. One-stop headquarters for all your Star Wars Half Marathon Weekend needs! Headquarters for everything you need to prepare for race weekend is at the runDisney Health & Fitness Expo in theDisneyland® Hotel Exhibit Hall. All runners must attend the Expo for race bib and packet pick-up. During this three-day Expo celebration, you’ll also be able to check out the latest Merchandise, and get a sneak peek at the latest in fitness apparel, footwear, sunglasses, high-tech gadgets, and nutritional products. If you are interested in becoming an exhibitor at the runDisney Health & Fitness Expo, please visit our runDisney Expo page. A variety of Official Star Wars Half Marathon Weekend merchandise will be available for purchase at the Expo. Last year was my first time attending Car Masters Weekend, a high-speed event dedicated to all things auto. I loved it! So, of course, I’m excited that the race is on to the 2014 rendition, taking place from 9:30 a.m. – 6 p.m. on June 14-15, 2014. This year, guests can cruise through over 100 classic, muscle and exotic vehicles at the Downtown Disney Car Show Presented by Meguiar’s. The cars will be displayed throughout the West Side promenade, where fans of all ages can vote for their favorite – I’ll probably vote for something ‘classic’ … I love those 60s era designs. Expert judges will also be scoring these sweet rides, culminating in a Sunday evening awards ceremony. Automotive Legend (and fan favorite!) Chip Foose will be returning to the event; he’s scheduled to make celebrity appearances and will take the stage to share his passion for cars. He’s also created some brand-new merchandise, available for sale throughout the weekend. If all that’s not enough to get you on the Car Masters track, you can also be part of the Chevrolet Performance Mobile Tour, take a seat inside some of the latest “Test Track” vehicles, and get up close to real-life supercars and new Piston Cup Racers Aiken Axler & Save VanDerSpin from Richard Petty, all at the new Event Expo. There may be additional evening events added to the lineup, so stay tuned. Plus, expect interactive activities from Disney Interactive, DisneyQuest Animators and more. 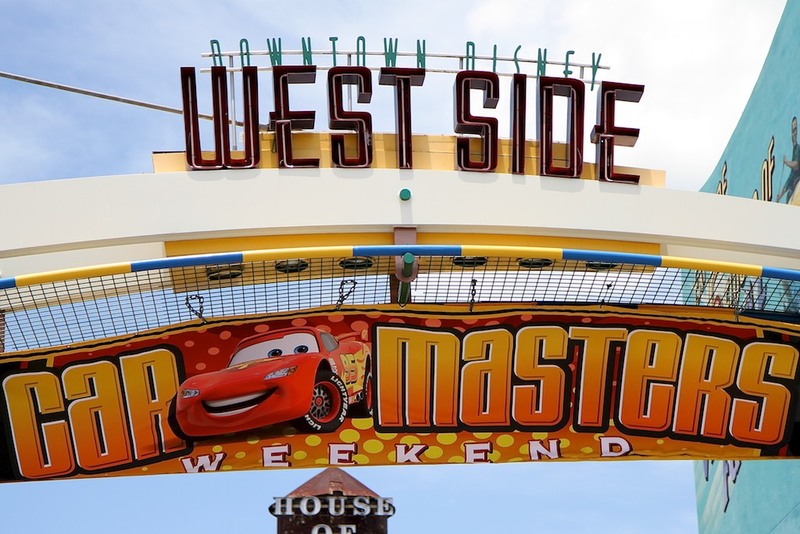 For more information about Car Masters Weekend, click here.